My appetite for cycling is closely linked to the classics. I've never really managed to make up my mind whether the Tour or the classics is my favourite, but then again, they're like apples and pears so why choose? How many classics are there? It depends on what calendar you are watching, the UCI World Tour calendar or the ASO calendar. Over the years, there have been many disputes between the UCI and ASO regarding the classics, in 2008 many of the classics as well as none of the GTs were part of the UCI Pro Tour as it was called back then. Even before that, all the classics were located under one calendar; the UCI Road World Cup. Perhaps that is somethig to establish once more, an independent body side by side the UCI? On the other hand, I would prefer a different and well functioned UCI, the last thing cycling need now is different agencies. Imagine Boonen vs Hushovd, Boonen being WWCU winner of P-R and Hushovd carries the belt of IUCF? Just like boxing or wrestling. No thank you. You also have the "Five Monuments of Cycling"; Milan-San Remo, Ronde van Vlaanderen, Paris-Roubaix, Liège-Bastogne-Liège and Giro di Lombardia. According to wikipedia, only three riders have won all five races during their career, Eddy Merckx, Roger De Vlaeminck and Rik van Looy. Now these three fellows have something in common, their Belgique nationality. The Belgians have dominated in the classics, and since the majority of the classics take place in Belgium, the supporters have a reputation for being crazy and the organisers keep serving beer to the fans. Many more races than the "Monuments" are my favourites. The famous classics and semi-classics like Ghent-Wevelgem, Amstel Gold Race, La Flecha Wallonne, Omloop Het Nieuwsblad or Kuurne-Brussel-Kuurne can provide just as much fun as the monuments. Huge events, gathering many spectators making it difficult hearing yourself when the riders pass. 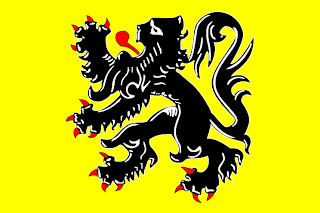 By the time the peloton pass, you'll probably find yourself screaming just as high, eating sausage and drinking Belgian beer while waving a Flemish flag. You remember K-B-K of 2010 when Traksel won? Not many riders came to the finish line then, the Broom Wagon was full from the first feed zone due to horrendous weather. So semi-classics can be just as hard on the riders as the classics. The pictures says it all. To me it is the essence of cycling; long, extremely challenging courses and some times the weather plays a huge part as well. The reconnaissance might be done on dry land, the cobbles tight pushed against dry sand. On race day, it can be muddy, the cobbles as slippery as ice, pushing clothing and equipment to the test. Proximity to the spectators are another aspect I cherish. 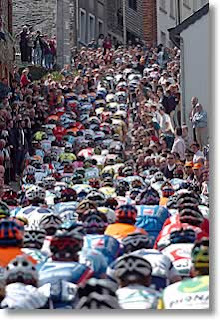 The races are packed with fans, just see pictures from the Muur. Riders have sometimes complained about fans throwing beer on them and this has happened to other fans as well. It is a giant Fiesta, so if you don't like get beer on your caps, try moving to another spot not so full of people. You also have the constantly Game of Fortune. I like to believe that the strongest rider win in the classics, we have all seen those mano-on-mano battles over the cobbles, history is full of examples. George Hincapie has been close to winning Paris-Roubaix several times. Perhaps the closest he came was in 2006, when he experienced trouble with the steering, flew over the handlebars and broke his collarbone. All while being in the lead group with a team mate close. So sometimes luck is in somebody else's hands. 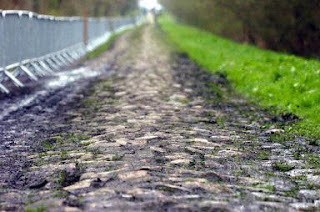 Next cobble season post: How to dress up yourself and the bike for the cobbles. An excellent article and, as a new follower of this sport, a great introduction. I suspect that like many newcomers, we never think beyond the multi-stage events..now I will watch the season unfold with both a renewed insight and a new respect to these warriors of the road. Ash- Thanks, appreciate it. I think it is important to get the whole picture out of cycling, the classics are just great ad there is so much history there as well. If you have the time, fly to Brussels in april and watch Ronde van Vlaanderen (RVV). They also have a sportive the day before. You can choose to ride 70 or 140 km of the actual course.